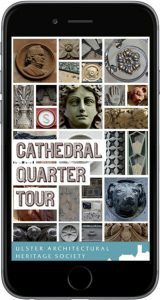 In 2014, Ulster Architectural Heritage developed the Cathedral Quarter Tour App. Look up and discover the rich architecture of Belfast’s former commercial heart. The Cathedral Quarter Tour app provides a guided tour of the architectural heritage of the Cathedral Quarter, an area of cultural and historical importance focussed around St Anne’s Cathedral, Belfast. 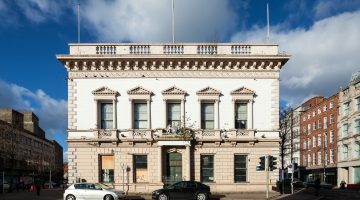 Despite this areas designation as a conservation area, plans have been repeatedly proposed for development affecting this, the cultural centre of Belfast. This tour aims to highlight the beauty and importance of the built heritage of the Cathedral Quarter, to local people and visitors, in a new and interactive way. Click here to download the FREE App for iPhone. Funded by NGO Challenge Fund, Department of the Environment NI. 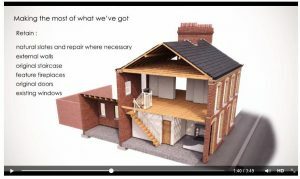 In 2013 Ulster Architectural Heritage and Hearth developed a short video to encourage heritage–led regeneration and the creative retrofitting of Belfast’s distinctive red brick terraces – protecting established communities and the homes of local residents. Working closely with Hearth Historic Buildings Trust and Big Lolly, the Ulster Architectural Heritage Society created a short film which demonstrates how our undervalued stock of traditional terraced houses can be retrofitted using energy–efficient measures. Using the retrofit scheme carried out by Hearth on the 19th century terraces on McMaster Street, Belfast as an example, the film highlights the importance of harnessing the embodied energy in existing buildings and aims to unmask the concept of retrofitting. 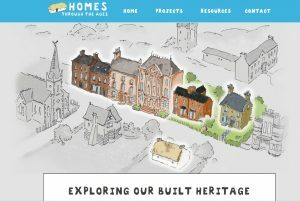 In 2014, Ulster Architectural Heritage and Hearth Historic Buildings Trust developed an educational resource for Key Stage 2, ‘Homes through the Ages’ is a website that provides an interactive learning tool that demonstrates the evolution of homes and highlights the importance of historic buildings in the role of a sustainable future. The site demonstrates the evolution of homes and underlines the important role of historic buildings in a sustainable future. The focus is on Georgian and Victorian properties, as they constitute the vast majority of historic homes still in use and uniquely features examples restored by Hearth. With engaging illustrations, photographs, quizzes and other useful links the user will be entertained whilst learning about historic buildings, construction, materials, architectural details, eco ideas and sustainability in relation to how people used to live. Download a copy of the Looking Back Moving Forward, teaching resource.